This diy polished concrete guide will help you to understand the processes involved and it will outline the steps in broad terms. Because there are many machines and chemicals that can be used in slightly different ways that cannot be covered in this article it is not intended as an actual step by step instructional for polished concrete, but it is close. Concrete polishing can be achieved to the same degree as granite where it is used in showrooms and homes. 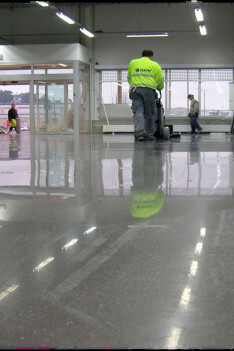 Polished concrete is also used for industrial floors due to its durability, ease of cleaning and low maintenance. 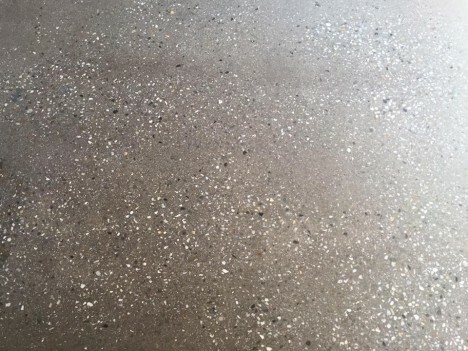 Many large commercial premises such as hardware chains use polished concrete which does not show the aggregate underneath and this is known as ‘polishing the cream’. More colorful, decorative and interesting effects can be obtained by cutting deeper into the aggregate (stones) before polishing. Diamond grinding is the best way to cut into the surface of concrete. The diamonds are mixed with metal powders in a mold and melted together under pressure in a furnace to produce a solid segment known as a metal bond segment. These blocks or segments are welded onto a metal grinding plate that is driven by a motor and scrapes across the surface of the concrete. Diamond segments come in various shapes and sizes for machines and for hand grinding cupwheels. There are also hybrid diamond discs that are combinations of metal bond diamonds, ceramic bond diamond segments and phenolic resin diamond segments which attach via a hook and loop backing. The sands in the concrete wear away the metal to expose the diamonds which then cut into the concrete. During this process the diamonds are worn away and fracture, but at the same time the metal is worn a little more (because it is softer than the diamonds) to expose more of the diamonds until all the segment is completely worn away and then the diamond grinding disc will have to be replaced. The metal surrounding the diamonds can be soft (for hard concrete) or hard (for soft concrete) and the size of the diamonds can vary from very coarse 16 grit to extremely fine 3,000 grit. The coarse diamonds are used to cut the concrete quickly and fine diamonds are for polishing. The basis for polishing concrete is to double the diamond grit size for each step to remove the previous step’s scratches until you have a polish. 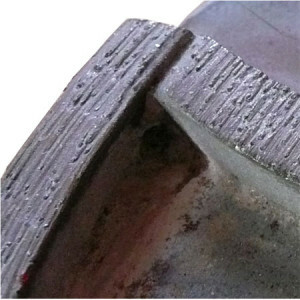 For a more detailed explanation of diamond grinding concrete see “Grinding Hard Concrete“. The first step for diy polished concrete is to use a concrete grinder that has multiple grinding discs underneath which is specifically designed to cut the concrete to the desired flatness by removing the higher areas. This can also be done with a single head grinding disc although more skill is required to maintain a flat look without producing grinding marks which are commonly called “shoulders”. With a single disc grinder the shoulders appear as ring marks in the floor. Use a coarse diamond first from 16 to 40 grit depending on how aggressively you wish to cut. 16 grit would be more common if a coating was being removed or if very hard concrete needed deep cutting to expose the aggregate. The lower the diamond grit number (more coarse) that you begin with the more grinding steps will be required with higher grit sizes later to remove the deep scratches. Larger machines are used for the bulk of the floor and special edge grinders are used for the wall edges and for small rooms, and corner tools are used in tight areas and corners. The concrete grinding process is continued until the desired look is achieved with respect to exposing the aggregate. The floor can be ground to expose the sands near the surface, or to partially show the stones or to cut into the stones to reveal more aggregate than concrete. When laying the concrete for diy polished concrete various colors can be selected for the aggregate and also for the concrete to enhance the appearance of the polished floor. Even objects like metal and glass can be added for greater visual effect. It is very important that the concrete layer leaves the aggregate at a constant level and does not step on the finished product or use boards to kneel on as they will push the stones down and grinding will expose the other stones leaving a foot print or board imprint in the aggregate. A good source of USA polished concrete ideas can be found at Polished concrete photos. This grouting process determines the difference between ordinary and excellent polished concrete. First time DIY polished concrete operators may not realize that concrete contains millions of tiny air holes throughout which are revealed when the top paste of the concrete is removed by grinding. These need to be filled for a uniform and dense polished concrete surface finish which can be done by hand using a polymer cement mixture or an adhesive similar to tile glue mixed with the grinding dust from the first grind and cement which is applied with a steel trowel across the entire floor surface scraping it into the holes without leaving very much on the surface. Some floor grinders have spray devices to wet the floor ahead so that the grinding dust mixes with the polymer as the grinding process proceeds which eliminates the labour of hand troweling or you can wet the floor ahead and pour the grout adhesive onto the damp area before the machine grinds over it. Adhesive-based grouts should be left to dry overnight or for a day after applying before grinding again. A tip with this guide to diy polished concrete if you want to do it yourself is to obtain some white tile adhesive and mix it with 10 parts of water to prime the surface. First wet the concrete and allow it to dry until damp, then apply the primer to the floor. Next mix the neat adhesive with equal parts of cement and concrete dust until you have a flowing mud consistency which you can trowel across the surface to fill in the small holes and cracks. Try to scrape the surface almost clean of grout. Grind again with a smaller grit then harden the concrete for greater durability. After filling the air holes the floor can be ground again with finer diamonds and then it should be “hardened” or “densified” with a chemical flooded across the floor. Most of these hardeners react with the chemical makeup of concrete to change the structure of it to a harder material than the original by filling in the capillaries in the concrete with water-glass which is a chemical reaction between the densifier and the concrete. This grouted and densified floor will polish to a high shine. Densifiers come as sodium silicate, potassium silicate, lithium silicate and magnesium flourosilicate. The best penetrating densifiers are Lithium based which will not produce a visible white salt like sodium densifiers can. The object of hardening is to achieve a denser, more uniform and deeper polished surface with greater wear characteristics. If you harden the floor yourself use a very wide broom with soft bristles to sweep the liquid across the floor evenly walking in one direction all the time continuing until there is no pooling. All pools should be broomed to areas that have dried early. Starting with 16 grit, the next grind would have been 30 grit, then 60 grit, then grouting at 120 grit and removing the grout at 120 grit. Next densify and begin with resin diamonds at 50 grit. With all the air holes filled and the floor hardened inspect the floor for imperfections and grind to 3000 grit. Sometimes the grouting process needs to be repeated and also the densifying. The metal bond diamonds can continue to be used up to 120 grit after which resin bond diamond pads are used. These are pads or buttons of resin with the diamonds mixed into them. Traditionally the grinding passes will start again at 50 grit resin, then 100 resin, then 200, 400, 800, 1500 and 3000. Between each pass the floor and the grinding equipment must be thoroughly cleaned so that the larger grit diamonds do not scratch the floor when a finer diamond pad is used. Edges must also be polished with each grit size and are done before each floor pass. After 3000 grit the floor should have a magnificent polished appearance that is hard, durable and easy to clean. Structural cracks that go all the way through a floor are usually caused by movement of the soil underneath. These will always move with the varying moisture content of the soil and the expansion and contraction of the concrete with changes in temperature unless the substrate is stabilized. Small surface cracks due to shrinkage of the concrete will be filled in the grouting process and will remain unnoticed. If the floor is obviously poorly laid you should expect problems like indentations from boots that have been troweled over later, but show up when the floor has been ground back. If you are a home builder and you want to polish your house slab grind your slab early because concrete hardens quickly and will become more difficult to grind, so for a new home it is better to grind, fill and harden, then take it to a low shine between 7-14 days after laying. It can be protected against most staining with a penetrating primer and finish coats. The polishing work can be completed later when the house is closer to finished, but ideally before the skirtings are in place so you do not have to do the edges by hand. Do you need to see the aggregate? It is more expensive and time consuming to expose the aggregate, but it does look good. The purpose of this guide to diy polished concrete is to help you to understand the processes involved.